Updated 9/9/07: Info provided by Teri, friend of Glenn Muchitello. Inscription: "In Loving Memory R.I.P." Description: This large wooden white cross sits on an embankment overlooking Hwy. 95. 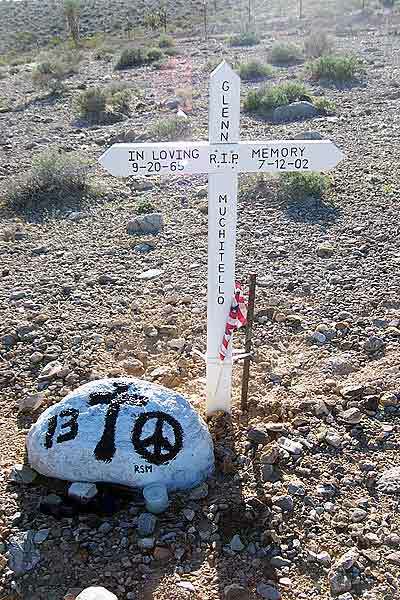 Next to the cross, a large rock has been painted white and emblazoned with a cross, the number 13, and peace symbol. A small American flag is tied to the cross, and a candle sits at the base of the rock. Analysis: Oh, man, after a weekend of binge drinking, gambling, and general debauchery, there is nothing worse than the loooong drive back to Los Angeles down Hwy. 15. Everyday, thousands of people make this lonely trek ... some sober, many not. Needless to say, there are quite a few white crosses littering Hwy. 15. I originally suspected that alcohol played a big part in Glenn's accident, but according to Glenn's friend Teri, a big rig was involved in the tragedy (Man, I've heard THAT before! See "The Few, The Proud, The Deceased"). Seeing how far from the road this memorial is, I suspect he was traveling very fast when went off the road. Hopefully, we'll be able to find out more about this case soon. "After spending a few hours looking for our friend Glenn Muchitello, I came across your website. Glenn was best friend to my husband Allan, they worked together at General Motors and spent many hours building fast cars and racing them at a local track. Allan left GM and Glenn divorced his with Revina ( we believe Revina painted and left the rock at the cross) and we lost touch....We heard Glenn was killed, but only know the accident involved a semi. If you ever get any more info, please let us know.